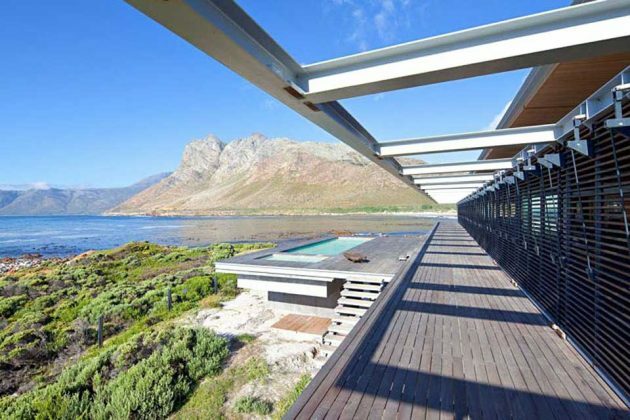 While most sea-front houses incorporate large openings like larger-than-usual windows and sliding glass doors to afford home owners a majestic view of the front, South Africa architecture firm elphick proome architects took it several levels up with this property located at Rooi-Els, Western Cape province of South Africa, some 5 km north of Pringle Bay. 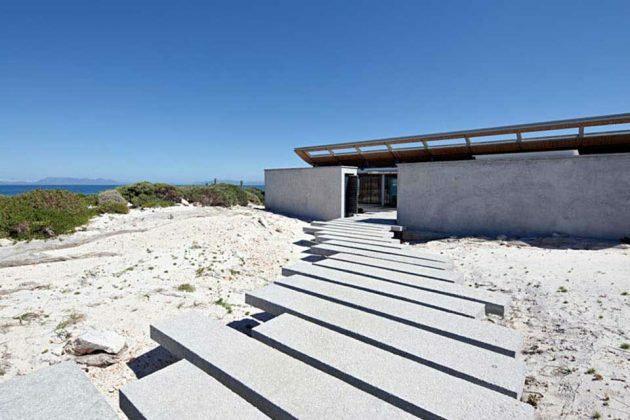 There are many unique aspects about this Rooi-Els Beach House, the first being where it is built on. 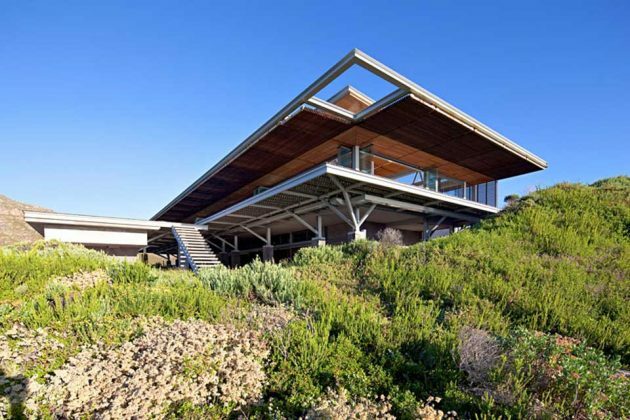 Unlike most beach houses which sit on regular sandy ground, this 950 square-meter property sits elevated over dune fynbos, a vegetation unique to Southern tip of Africa, on a rugged ocean peninsula which is not the best place for taking a dip in and that probably explains why it has its own deck and pool up front. 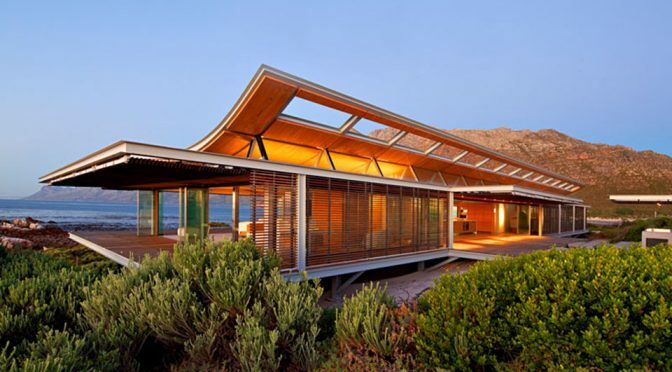 Also, while most sea-front houses usually provides view of the front, Rooi-Els Beach House was designed with 360-degree views in mind and thus, an open concept approach was adopted, both with the facade and with the interior. The house was built around a steel frame with “exo-facade” made up of hydraulically operated top-hinged timber slated screen system for times when modesty is required. 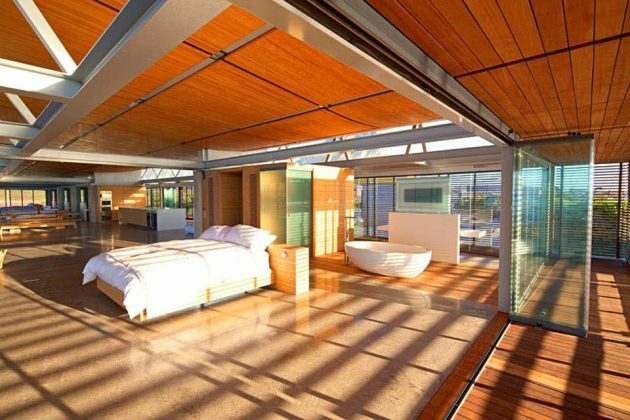 When it is not, the frameless sliding glass doors all around offers a magnificent view of the surrounding, while the hull-shaped roof provides additional views of the nearby mountains. 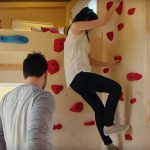 There are no permanent walls on the inside; instead it has internal partitions that can be slide away to create a single, expansive living space. 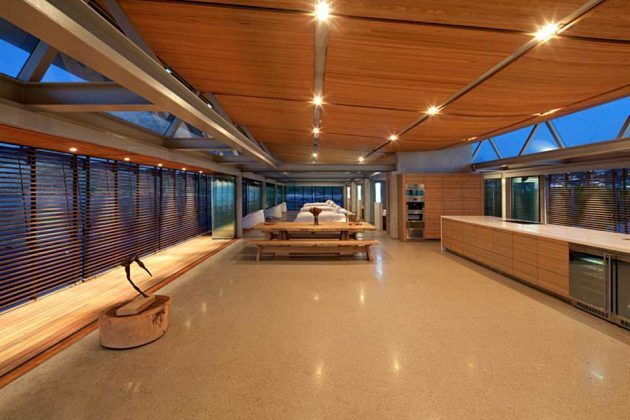 With the sliding walls out of the way, the three individual rooms, each with its own attached bathroom, along with the two master suites, a complete kitchen, and dining/living area, all becomes one big living space that affords its occupants has an uninterrupted view of the False Bay that runs into the South Atlantic Ocean. 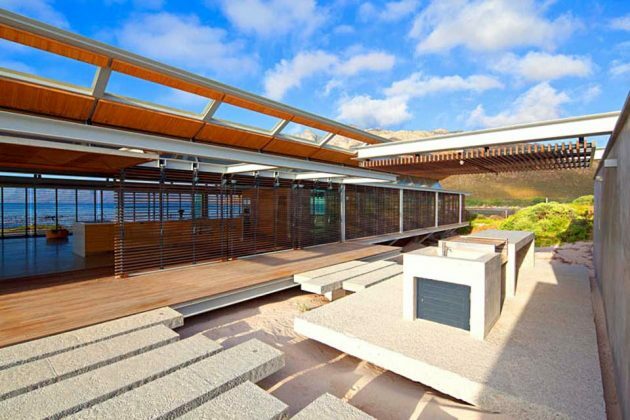 Rooi-Els Beach House is easily the most open home. 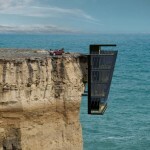 Seriously, we doubt you will find anything this open anywhere in the world other than a pavilion or gazebo. 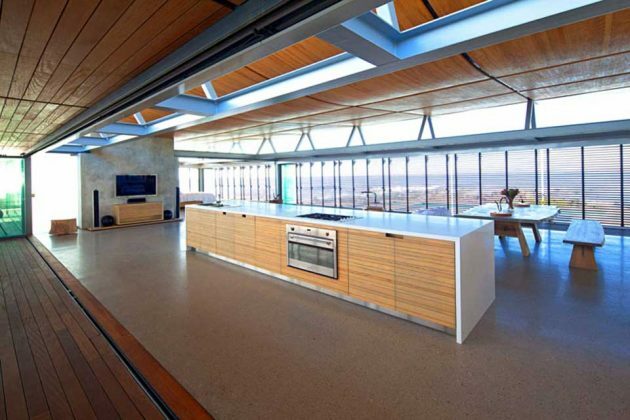 Then again, the location has to offer such marvelous views to warrant such a design. It would be completely pointless if there are other buildings just meters away. Scroll down to steal a few more looks. 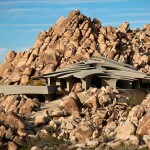 Images: Dennis Guichard via Contemporist. 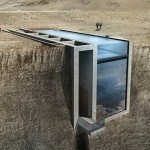 Casa Brutale: Why Hang off a Cliff When You Can Live Inside the Cliff?